Our list has been hijacked by several true crime websites - any free variation of this list that you find on the internet will be severely outdated. Since inmate address change, deaths and transfers are a common occurrence we update the list regularly to maintain it's integrity so that you do not waste time and money on postage to incorrect addresses. 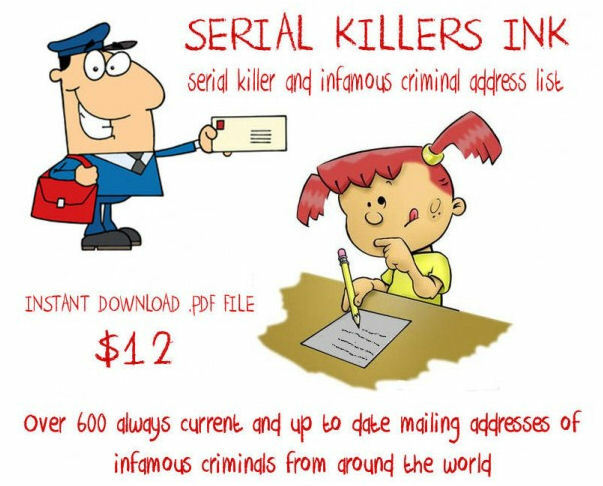 Our serial killer address list contains over 600 current and up to date prison addresses of infamous inmates from around the world. We constantly keep the list up to date to reflect new arrests, deaths and transfers. Our list is never outdated and you can be sure that the list is current and an up to date roster of addresses. You will not find a more up to date and current list. Period. The latest edition is SPRING 2019; Revision 1.0: Latest update APRIL 12, 2019. THE PURCHASE OF AN ADDRESS LIST ENABLES YOU UNLIMITED FREE UPDATES FOR A YEAR. Upon check out you will instantly receive an automated email with a direct link to the .pdf file. Simply click the link to load the .pdf in your browser and then save it to your computer by choosing file/save from within your browser. In the rare event that your mail client marks the email as spam and you do not receive the email - simply send us an email at admin@serialkillersink.net requesting the list.